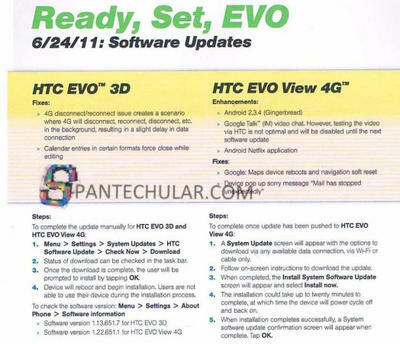 Are you all set to pick up an EVO View 4G tomorrow from Sprint? Pretty excited for your new tablet? What if we were to tell you that you’ll get a software update on launch day to Gingerbread? How excited are you now? According to sources at Spantechular, an internal memo has gone out to Sprint stores that says as soon as you walk out of the Sprint store tomorrow with your shiny new 7-inch tablet, you’ll be able to update to Gingerbread, and that also means you’ll be able to use Netflix. Who doesn’t want a little streaming video on their new gadget? Normally this update would also mean you’d get support for video chat via Google Talk, but as the memo says, testing of that didn’t go so well and it is delayed until the next software update. Kind of a pain you have to do the update yourself, but at least you know you don’t have to wait forever to get some Gingerbread goodness on your EVO View 4G! Are you interested in the EVO View 4G? Does the immediate update to Gingerbread sway your purchasing decision at all?